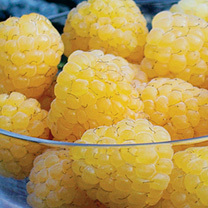 An outstanding autumn-fruiting raspberry, producing large, golden yellow fruits, with a taste that is even more exquisite than its red-fruited sisters! An excellent raspberry for fresh use and freezing and also for garnishes and wine-making! Plant 45cm (18") apart; 1.8m (6') between rows. Full growing instructions included.